Evan is her reluctant protector, the last of the Templar Knights, who's watched her from the shadows since she was a teenage girl. When an assailant from the past emerges and steals the key to keeping the rest of the world safe, Evan and Zoe must form a tenuous alliance to get it back. Up against a mysterious enemy older than time, and a really pissed off God of War, Zoe and Evan have the odds stacked against them as they try to reclaim the Hope of all humanity. That's if they can avoid killing each other. 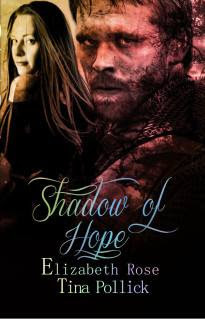 Shadow of Hope is a fast paced, thrilling paranormal romance novella. Author Elizabeth Rose grew up in a household where reading was a favorite pastime. Having been encouraged by her parents as a young child to pursue the greats (Dr. Seuss and Amilia Bedilla) she quickly found herself wanting more than to just read stories of Charming Princes in far off lands; she wanted to write them as well. Having been a follower of Gabriel, Elizabeth found a strong bond of friendship with author Tina Pollick. Having many common interests, Tina and Elizabeth decided to attempt co-writing a novel together. The end process was both enjoyable and enlightening. Elizabeth currently resides in Wyoming with her two dogs, Bard and Blade. She is graciously allowed to attend the needs of her tomcat Tinker. Shadow of Hope is her first book. Stop by and say hi! When Tina Pollick isn’t writing paranormal romance about Heavenly hunks, and smart, sassy women, this RN enjoys a quiet home life with her husband, children, two horses, two dogs, cat, chickens, guineas, well sort of quiet. Tina’s first paranormal romance novel, GABRIEL, A Kematian Hunter Series was published in January 2013 by Evernight Publishing. The first in a three novella series, SOUL BROKER, will be published by Moon Rose Publishing in August 2013. Stop by and say hello! GABRIEL is available on Amazon, Smashwords, Barnes and Noble and Evernight publishing.
. There wasn’t any way she was going to eat anything he had to offer again. “What’s that supposed to mean?” He flopped down on his chair, lifted the footrest and kicked back. “Why would you do that?” She stalked toward him, stopping inches from the chair. “I don’t?” He glanced down at her purse. “It’s not like you could talk.” He closed his eyes. “If only I were that lucky,” he muttered. She stomped out of the room and slammed the bathroom door shut behind her. She glanced around. A stand up shower stall, a sink and toilet. She looked up and saw the small window near the ceiling. She sucked in her gut and let it out with disgust. There was no way she was going to fit through it. She reached under her shirt and rubbed the mirror that hung from the chain. A nervous habit, but that one piece of jewelry always brought her comfort. She called out to her other source of reassurance. “Gran? Gran are you here?” she whispered. “Oh, well that’s too bad.” Her spirit floated up to the window. The morning light streamed through her nearly transparent form. “I met him last night. Someone was chasing me and Evan grabbed me and pulled me inside.” Zoe paced the small area, still trying to sort out what happened. It was easier now that the fog from her brain had lifted. “Yes.” She went on to tell her grandmother what happened and how she became Evan’s guest. Zoe pointed to the door and her grandmother went through it. She returned a few minutes later.